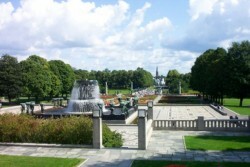 Vigeland Sculpture Park is a part of Frogner Park, located in Oslo, Norway, 3 km northwest of the city centre. The park covers 80 acres (320,000 m2) and features 212 bronze and granite sculptures created by Gustav Vigeland. Vigeland personally sculpted every figure out of clay and individual craftsmen were contracted to fabricate the pieces into what they are today. These works of art reside along an 850 meter-long axis divided into six sections: The Main Gate, The Bridge, The Children�s Playground, The Fountain, The Monolith Plateau and the Wheel of Life. Forged of granite and wrought iron, the Main Gate serves as an entrance to the park itself. It consists of five large gates, two small pedestrian gates and two copper-roofed gate houses, both adorned with weather-vanes. The Main Gate was erected in 1926 and was financed by a Norwegian bank. 58 of the park's sculptures reside along the Bridge, a 100 meter (328 ft) long, 15 meter (49 ft) wide connection between the Main Gate and the Fountain. All are clad in bronze and contribute to the “Human Condition” theme of the park. Here visitors will find one of the parks more popular statues, Sinnataggen or, “the Little bad Angry Boy”. In 1940 the Bridge was the first part of the park to be opened to the public. Visitors could enjoy the sculptures while most of the park was still under construction. At the end of the bridge lies the Children�s Playground, a collaboration of eight bronze statues, all in the likenesses of children at play. In the centre, mounted on a granite column, is the representation of a fetus. In this area there is also a pond where ducks and geese swim. Originally designed to stand in front of Parliament (Eidsvolls Plass), the Fountain was fabricated from bronze and adorned with 60 individual bronze reliefs. Portraying children and skeletons in the arms of giant trees, the Fountain suggests that from death comes new life. On the ground surrounding the Fountain lies an 1800 square meter mosaic laid in black and white granite. It took Vigeland a great deal of time to establish the monument: from 1906 to 1947. The Monolith Plateau is a platform made of stairs that houses the Monolith totem itself. 36 figure groups reside on the elevation bringing with them the “circle of life” message. Access to the Plateau is made via eight figural gates forged in wrought iron. The gates were designed between 1933 and 1937 and erected shortly after Vigeland died in 1943. At the highest point in the park lies the park's most popular attraction, The Monolith (Monolitten). The name derives from the Latin word monolithus from the Greek word ������ϑ�� (monolithos), derived from ����� ("one" or "single") and ��ϑ�� ("stone") implying the totem to be fabricated from one (mono) solid piece of stone (lith). Construction of the massive monument began in 1924 when Gustav Vigeland himself modeled it out of clay in his studio in Frogner. The design process took him ten months, and it is speculated that Vigeland had the help of a few sketches drafted in 1919. The model was then cast in plaster. In the autumn of 1927 a block of granite weighing several hundred tons was delivered to the park from a stone quarry in Halden. It was erected a year later and a wooden shed was built around it to keep out the elements. Vigeland�s plaster design was set up next to it to give reference to its sculptors. Transferring of the figures began in 1929 and took 3 stone carvers 14 years to accomplish. On the Christmas of 1944 the public was allowed to admire The Monolith and 180,000 people crowded the wooden shed to get a close look at the creation. The shed was demolished shortly thereafter. The Monolith towers 14.12 meters (46.32 ft) high and is comprised of 121 human figures rising toward heaven. This is meant to represent man�s desire to become closer with the spiritual and divine. It portrays a feeling of togetherness as the human figures embrace one another as they are carried toward salvation. At the end of the 850-meter-long axis lies a sundial, forged in 1930, and finally the Wheel of Life, crafted in 1933-34. The wheel is more or less a wreath depicting four people and a baby floating in harmony. It is a symbol of eternity, and implies the overall theme of the park: man�s journey from the cradle to the grave.